Hey! It's good that you came here! I can see that you're looking for a tutorial on how to fix the Error Establishing Database Connection error. You have nothing to worry about! This error simply means that due to some reasons or issues, your PHP code was not able to establish a connection with the MySql database and was not able to fetch all the details that are needed to build a page. Let's fix it! Go to hPanel -> MySQL Databases, and check the databases information: MySQL Database, MySQL User, MySQL Host and password (reset by pressing "Change password", if needed). 2. Go to your hPanel -> File Manager, and open wp-config.php file. 3. 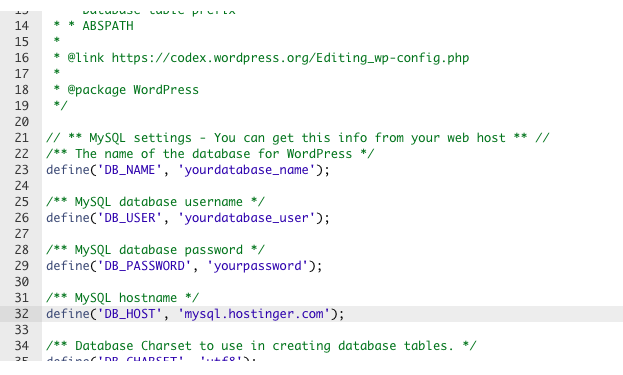 Make sure that all of your information is the same on your MySQL Databases section and in your wp-config.php file. Still getting it? Try checking Tutorial or contact our awesome CS team!